Full steam ahead from Hainburg to Bratislava and back! Let`s go with us on a cruise from Bratislava to Hainburg! Explore a charm of medieval town of Hainburg afoot or by bikes. 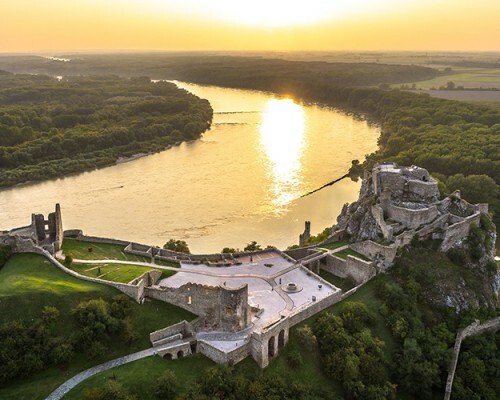 A ferry for 49 passengers is a great way for everyone, who wants to escape from a rush of Bratislava and get to know countryside of the Danube region. Unique boat-atmosphere together with unforgettable views to the surroundings and National park Donau Auen and other cultural sightseeings will make a great experience from your cruise. Since a transport of bikes is permitted, the cruise is an ideal opportunity for each bike rider to vary his tour! Add to your cruise a guided walking tour and get to know medieval nooks of Hainburg! Duration: 1,5h, combination of english and german (guaranteed), combination of german and slovak (reservation required at least 2 days in advance), price : 5 Euro (adult), 4 Euro (child up to 14 years).